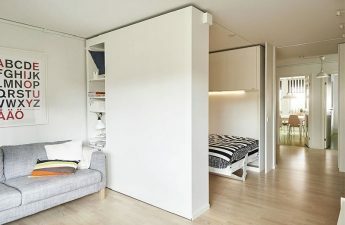 Modular wall in the interior of a small apartment BA small apartment modular wall can be a real salvation. 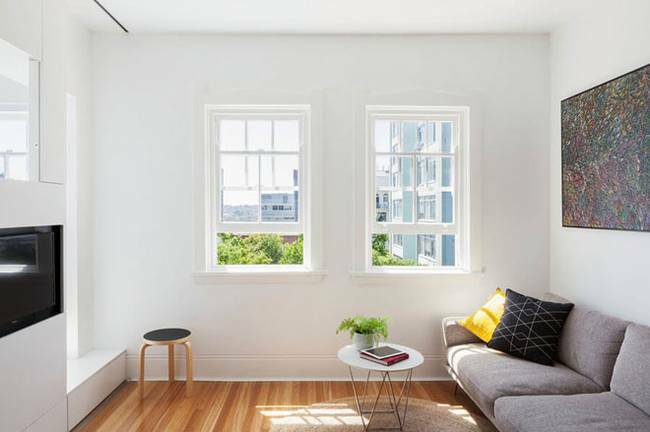 The growth of rent has led to the fact that people have to live in smaller and smaller rooms, however, this provokes imagination and the search for creative. 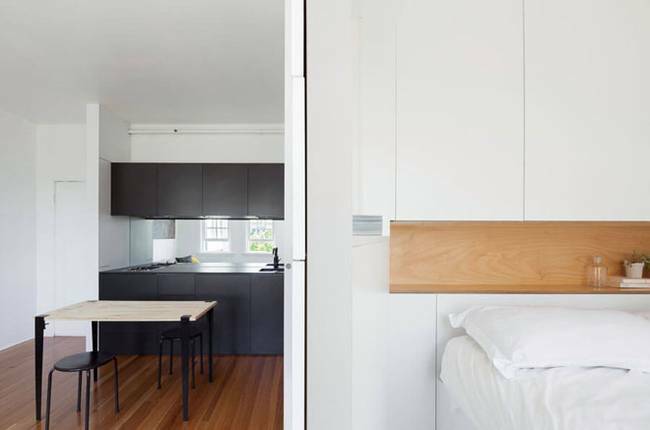 Using sliding doors that hide the mess and divide the territory, Australian architect Brad Schwartz designed this project that maximizes the use of space in Darlington, New South Wales. 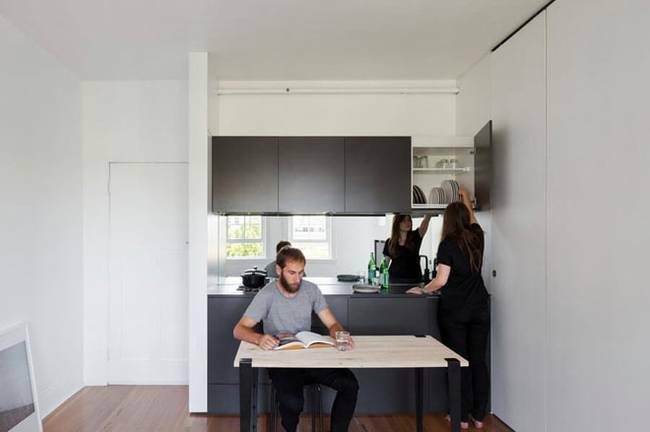 The storage system performs another function -sharing space Working with a limited budget in a very limited space, Schwarz manages to solve the problem of lack of space. He added a wall to the room, which is a modular storage system, thereby endowing it with various functions. 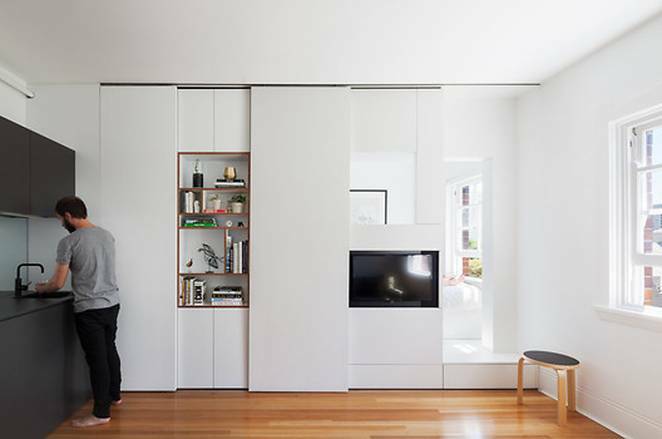 The architect explained: “Although this apartment was originally a one-room apartment, my task was to fit into it all the usual areas for living: an open living room, dining room and kitchen. The minimal design of the design was chosen to fill the room with light and create the illusion of space. 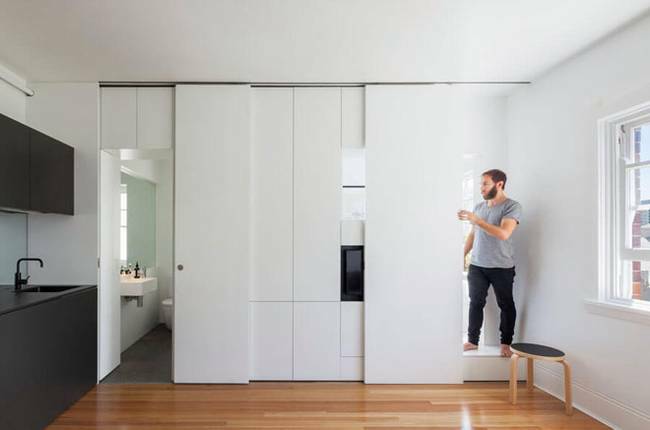 ” This transforming wall with a width of only 43 cm contains a folding table, a mini bar and a place to store books and other personal items. On the left is the compartment door that leads to the bathroom. Numerous boxes have great functionality. In order to create the illusion of a large room, Schwartz made parquet and the most subtle elements. The parquet was chosen especially for a small room. 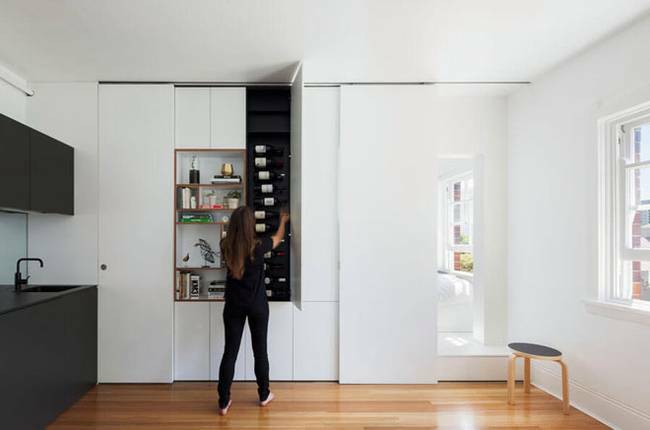 The kitchen apron is a mirror that visually expands the space. Mirror finish extends space Bthe bedroom is also led by a compartment door. 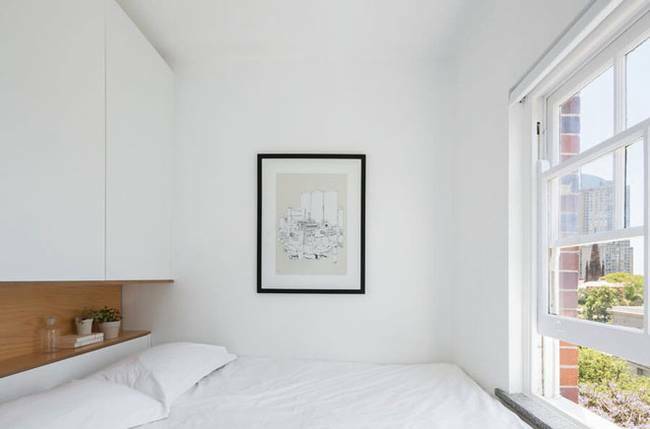 The whole room is occupied by a spacious bed, under which there is a convenient storage system. 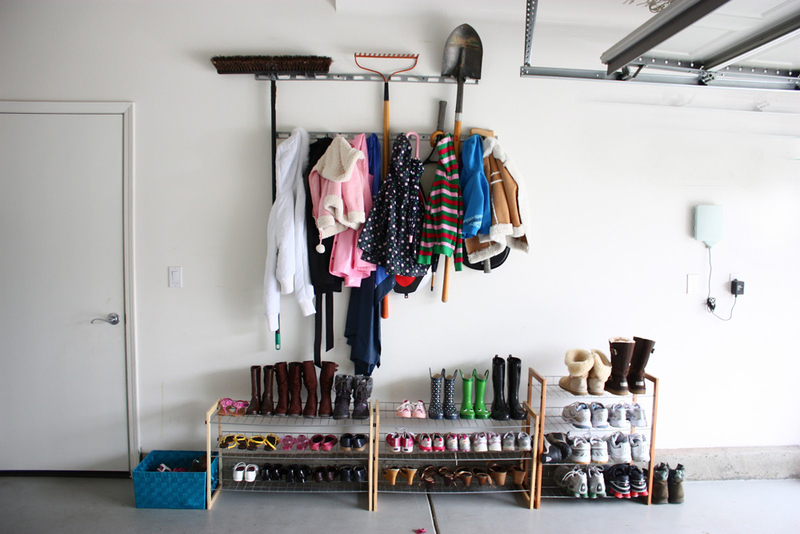 In addition, storage boxes are built into the walls. The whole bedroom is occupied by a comfortable bed. 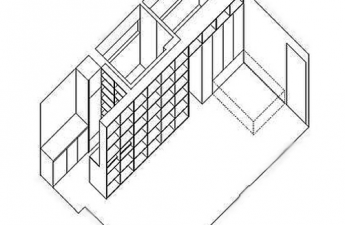 Architectachieved successful separation of space and filling a small apartment with all the functions of a large living space. Small but important elements, such as mirrors and special flooring, are brilliant ideas that will allow you to expand any space. Do you think this wall is functional? Share your thoughts in the comments!